Cleaning your awning is a great way to welcome the spring season and increase aesthetic appeal! It looks like all the snow is finally behind us, but your awning may have taken a beating this winter in Maryland! Whether you have a commercial awning or a residential awning, each style is subject to wear and tear from the elements. When you establish a cleaning routine for your awning, however, you can keep it looking pristine. Below are a few helpful cleaning tips. Even over a short period of time, awnings can easily get covered and damaged by dirt, dust, debris, and other threats. If you have a lot of large trees near you, you just have to deal with the fact that leaves are going to land on your awning and will need to be removed. The amount of dirt and debris your awning endures will determine your rinsing schedule, but the key is to establish a regular routine. Fortunately, you won’t need any special tools to get the job done. You can just use a garden hose and ladder to remove the dust, debris, dirt, and leaves. 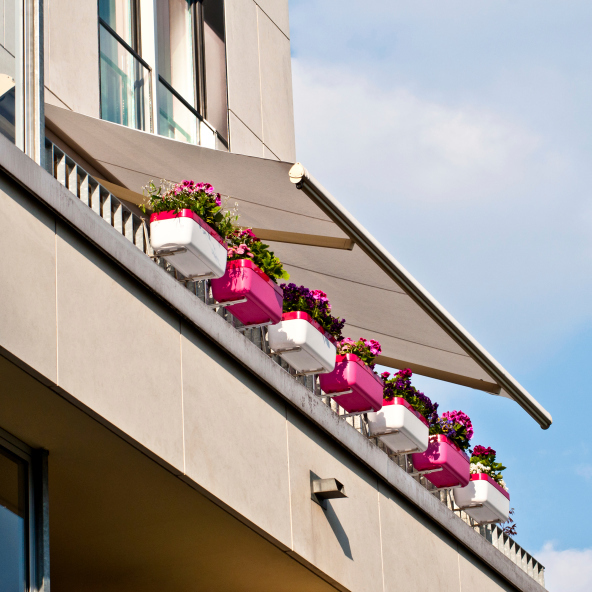 A quick rinse will help remove the dirt and other debris from residential awnings and commercial awnings. But to get your awning looking brand new again, you need to make sure that you scrub it with soap and water. When you do use soap and water, make sure you use the appropriate cleaning method. Metal awnings will need to be cleaned differently than fabric awnings. For instance, you can scrub metal material much more aggressively than you can with fabric material. For fabric awnings, you will want to make sure to use a mild solution with a very soft-bristled brush. Sometimes, there will be stubborn stains and dirt that just aren’t removed by rinsing or scrubbing. At this point, you may need to spot treat individual stains that don’t seem to be coming out. You can use distilled white vinegar and water, or you can try using a cleaning solution that is made for ovens and cooktops on metal awnings. For fabric awnings, try soaking stains with a cleaning solution that you would use on your laundry. If you’ve been neglecting your awning, now is the perfect time to establish a cleaning routine for the spring and beyond. Starting now, make sure to remove leaves, twigs, and any debris from your awning. It may seem a little overwhelming at first to create a routine, but you will thank yourself later if you create a regular maintenance schedule. It will make it much easier to care for your awning in the long run, and you’ll be thrilled with how your awning looks.